It took years before a decision was made. Then it took months to complete the project. However, it took only a weekend to complete the finishing touches! What took years to decide was exactly what to do with the Adirondack furniture my sister gave me. 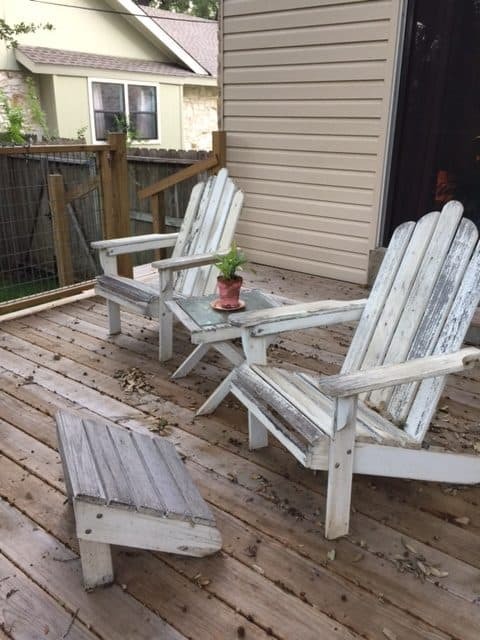 These chairs, footstools, and the matching table sat and weathered in the elements for years getting rougher to the touch as well as unstable. We just couldn’t decide what color to paint them. Adirondack furniture in need of some love and care. Once we finally decided what to do, it took several months to do the work. The finishing touch for the Adirondack furniture was making pillows with ruffled edges to add a little bit of visual contrast and physical comfort to the chairs. Have you been wanting to add some finishing touches to an area of your home? Are you in need of some pillows to add color or comfort to your outdoor space? I invite you to learn from my experience and you, too, can make outdoor pillows in a short period of time. I had 3 pillow forms, however, their original casing had torn. Original pillow form casing that tore. I made new ones out of old sheets and reused the stuffing. First, I cut 2 pieces for each pillow form that was the size of the original forms. I didn’t include anything additional for seam allowance because I wanted the pillows to be a little plumper than they were originally. Then, I sewed the two pieces together almost all the way around the perimeter using a 1/2 inch seam allowance. After that, I stuffed them with all the stuffing that was exploding out of the torn pillow casing and closed the small opening by hand with a whip stitch. 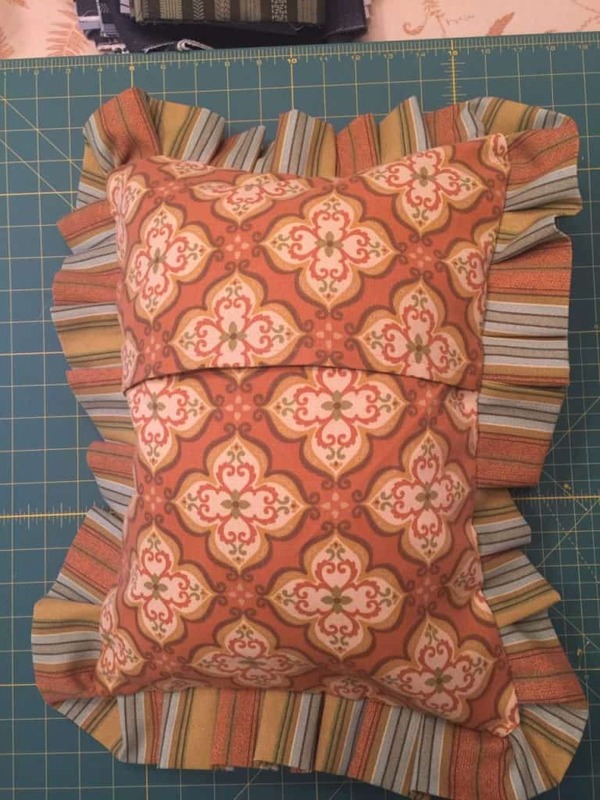 Use old sheets to make the casing for new pillow forms. To get the dimensions of a pillow form, measure the width and length across the curve of the pillow. 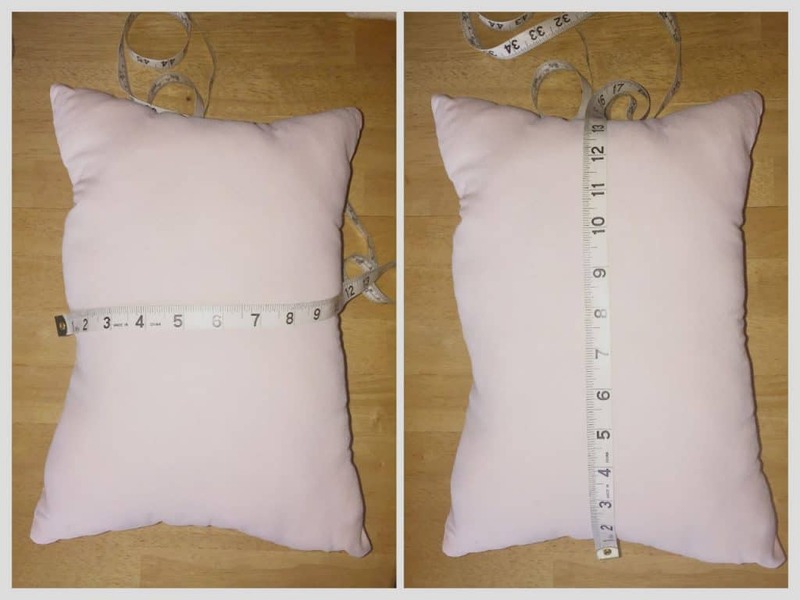 Make sure when you measure, you are starting and stopping at the midpoint of the pillow. In the picture above, it looks like the beginning of the tape measure is touching the table, but it’s actually at the seam line of the pillow form I made. One side of the pillow cover (the front) will be the pillow form dimensions plus 1 inch for the length and width. (This inch will allow you to use a 1/2″ seam allowance when sewing.) 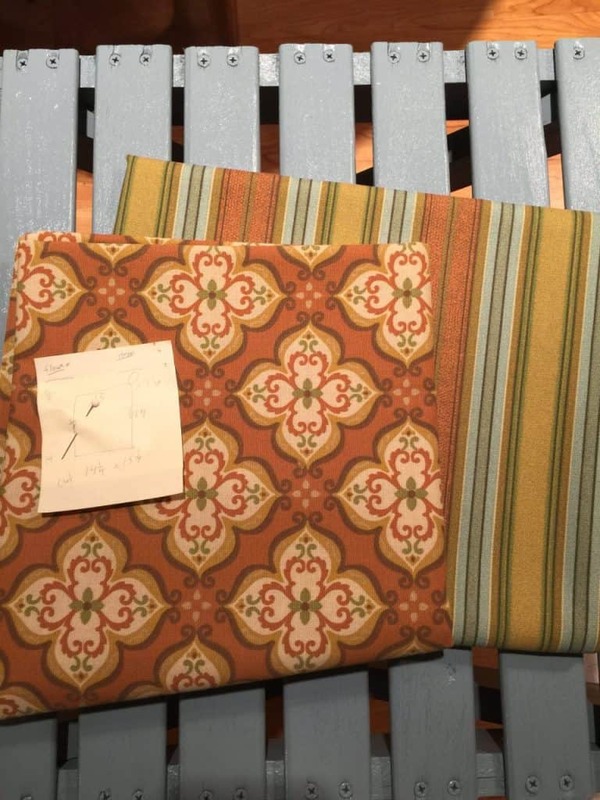 So, if the pillow form measured 11″ x 15″ you would cut the front piece of fabric 12″ x 16″. The fabric for the back of the pillow will actually be longer. Why? To get the pillow cover on and off easily, I wanted the fabric on the back of the pillow to overlap (sometimes called an envelope closure). Decide what width you want for your ruffles. Double that width. Add an inch for seam allowance. For my pillows, I wanted about a 2″ ruffle showing. Keeping in mind a 1/2″ seam allowance, the fabric for the ruffle needed to be 5″ wide. This would allow me to fold the fabric in half along the length so the width of the ruffle becomes 2 1/2″ (a finished 2″ ruffle with 1/2″ seam allowance). 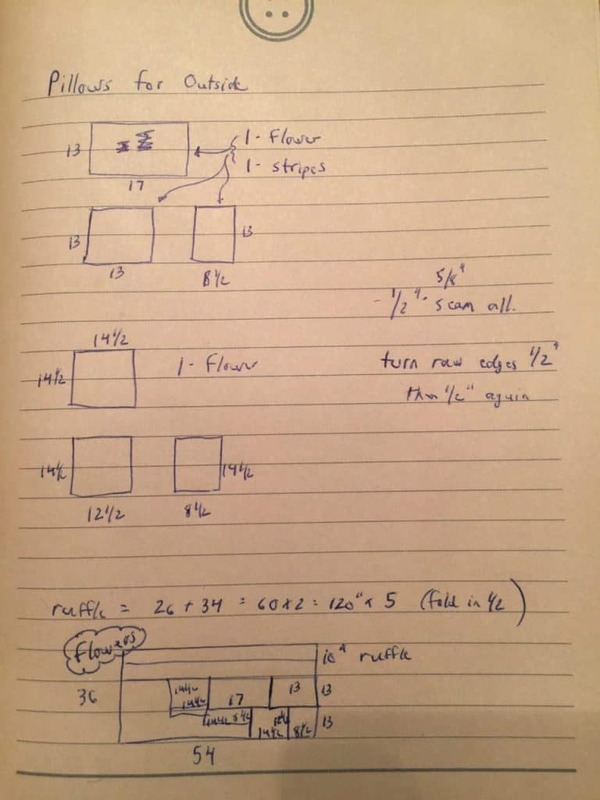 The ruffle length is determined by adding up all the edges of the pillow and multiplying by 2. Staying with the pillow form that is 11″ x 15″, all the edges added together would be 52″. By doubling this amount you’ll have plenty to work with and can cut off the extra when you get the ruffle in place. I suggest determining the size of the pillow cover pieces, the length and width of the ruffle, and how to lay out the pieces before you ever shop (or look in your stash) for fabric. 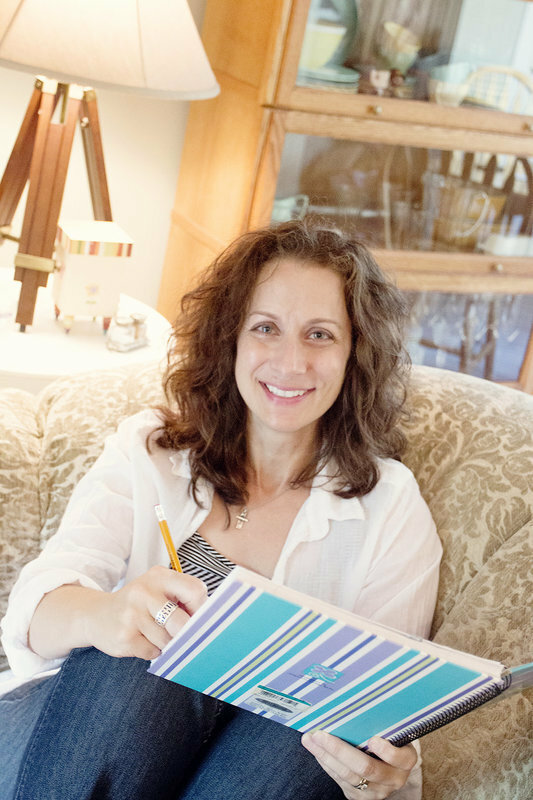 You might even go as far as to sketch one layout for fabric that is 42″ wide and another layout for 54″ wide fabric. By taking these steps first, you’ll know how much fabric you’ll need. In addition, when you don’t have pattern pieces, drawing and/or sketching out your measurements and how you’ll cut your fabric helps you clarify accurate measurements and visualize the best way to cut your fabric when you are ready for that step. Create visuals to make measurement thinking visible and reduce the possibility of math mistakes prior to cutting fabric. For my pillows, I wanted two pieces of coordinating fabric so the ruffle and the main part of the pillow weren’t identical. When running errands a few years before I made these pillows, I had an impulsive desire to look at fabric. I found coordinating fabric I liked but hadn’t measured the pillow forms (which I had had for years) or determined how to lay out the pieces. So, I didn’t know how much fabric I would need. The width of the fabric I liked was 54″ so I got a yard of each. This ended up being quite a bit more than I actually needed to make the three pillows featured in this post. Cut all the pieces out and set the front and back of the pillow off to the side. Take the two long pieces for the ruffle and put the right sides of the fabric together. Sew them along one short end. Press seam open. Fold 1/2″ of one short end of the ruffle under toward the wrong side of the fabric so the raw edge isn’t visible and press. Fold the entire ruffle length in half and press. So, if the width of the ruffle was 5″ and the length was 100″, after this step the ruffle would be 2 1/2″ x 100″. Taking the front of the pillow fabric, lay it with the right side up. Attach the ruffle to the front pillow piece starting in the middle of one of the sides (not in a corner). 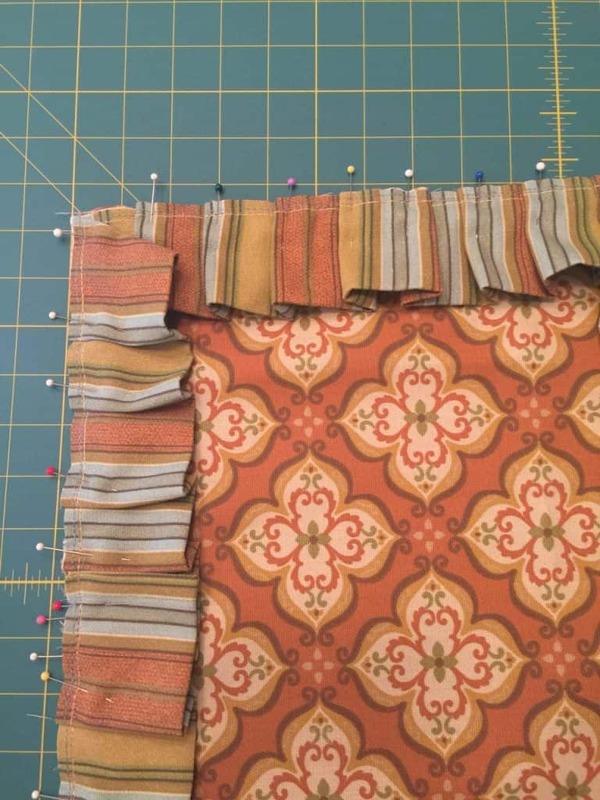 Create a pleat (folding the material back on itself) every inch or so and pinning it down. Overlap the beginning and end about two inches. Cut off any additional length. Fold 1/2″ of the short end of the last part of the ruffle under so the raw edge isn’t visible. Press. Sew the ruffle in place using a 1/4″ seam allowance. This picture shows a pinned and sewn ruffle. I didn’t remove the pins as I sewed. Take the long back piece and cut it approximately in half. (With the example used in this post, after cutting a back piece measuring 12″ x 24″, you would have one piece 12″ x 14″ and another piece that is 12″ x 10″. On each piece, fold about 1/4″ to the wrong side on what will be the overlapping edges and press. Fold and press again so the raw edge isn’t visible. Lay the front piece of the pillow cover with the attached ruffles right side up. Pin the shorter back piece on first. Right sides of the pillow fabric should be together. Raw edges should be lined up. The finished edge on the shorter back piece should be in the middle of the pillow. Lay the longer back piece on top of everything and pin in place. Raw edges should be lined up. The finished edge should be parallel to the other finished edge but will overlap. 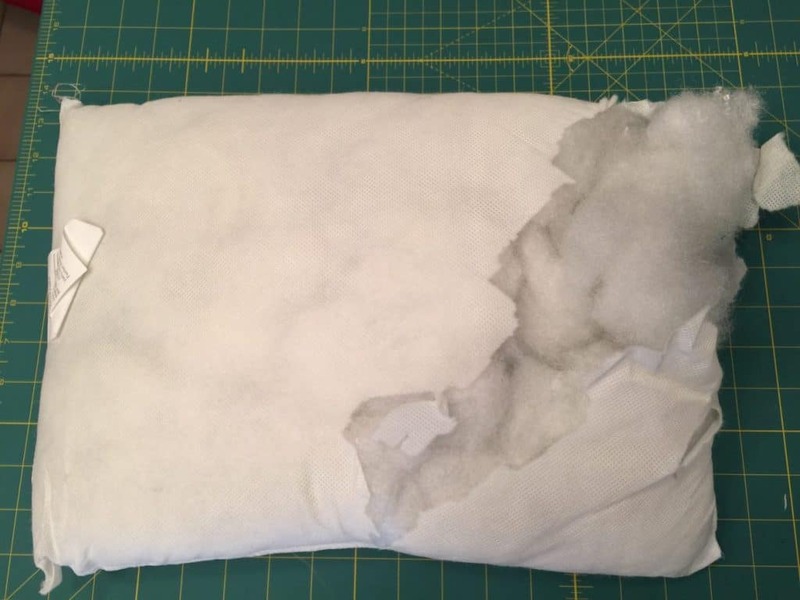 Sew both pieces down using 1/2″ seam allowance around the perimeter of the pillow. Turn the pillow cover right side out. Insert the pillow form and plump it up. It doesn’t have to take a long time to make your outdoor space a little more comfortable or have pops of color. 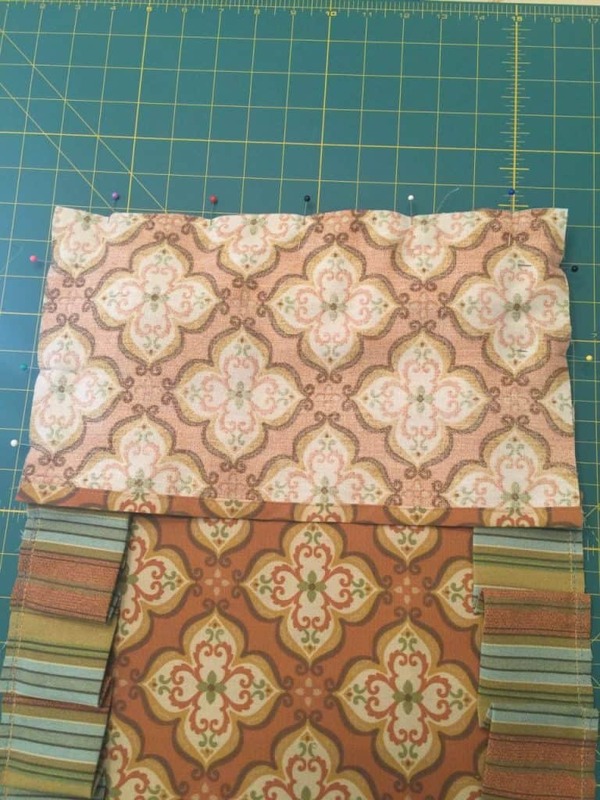 Sketch out how you will cut the pieces from fabric that is both 42″-44″ and 54″ in width. The steps to making a pillow cover with ruffles are straightforward. 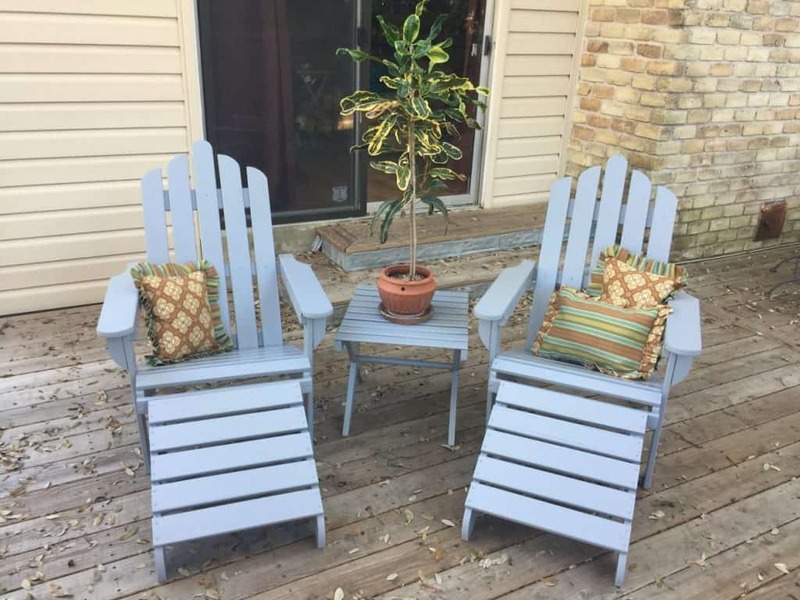 Once you make one, you won’t want to stop with your outdoor space! 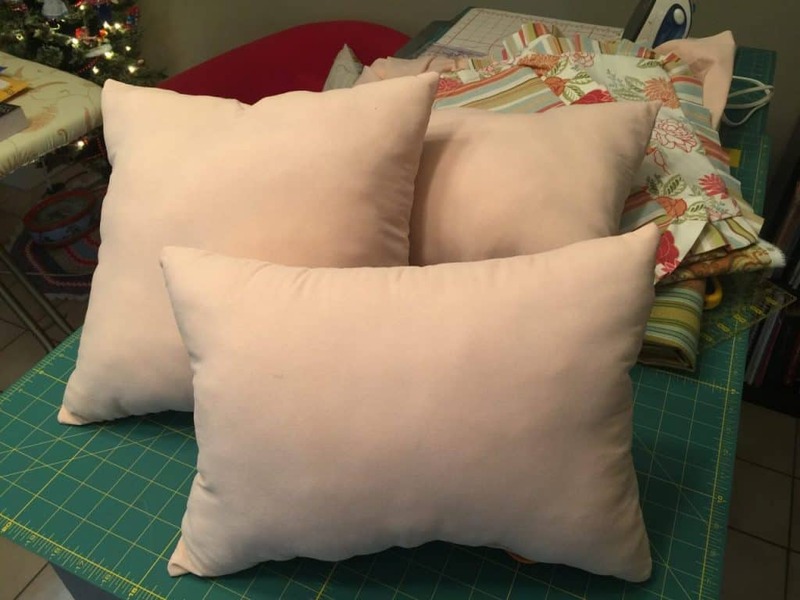 Note: The original post describing how I made the pillows is in the third link listed below. The section above on making the ruffled pillow covers is revised from the original content to include more detailed directions.